During a spacewalk at the International Space Station on Jan. 23, NASA astronauts Scott Tingle (bottom) and Mark Vande Hei replaced a degraded latching end effector, or "hand" at one end of the Canadarm2 robotic arm. Two NASA astronauts embarked on a spacewalk today (Jan. 23) and successfully replaced a degraded robotic "hand" outside the International Space Station (ISS) despite a software glitch that left the team running behind schedule. Expedition 54 flight engineers Mark Vande Hei and Scott Tingle suited up early today and emerged from the Quest airlock at 6:49 a.m. EST (1149 GMT) — 21 minutes ahead of schedule — and they spent a total of 7 hours and 24 minutes working outside the orbiting laboratory. Before they could make the swap, the two spacewalkers first needed to retrieve the spare LEE from an external stowage platform, designated ESP-2, where it has been stored since a NASA space shuttle delivered it to the station in 2009, Tim Braithwaite, the ISS program liaison for the Canadian Space Agency, said in a briefing Thursday (Jan. 18). NASA astronaut Scott Tingle (bottom) struggles to mount a portable foot restraint as NASA astronaut Mark Vande Hei looks on. To the left of the spacewalkers is the latching end effector LEE-B, which they replaced during their spacewalk together on Jan. 23, 2018. "We don't need you to make that thing pretty, but we appreciate the origami skills," NASA astronaut Victor Glover and capcom officer for this spacewalk joked as Tingle meticulously worked to fold one of the large space blankets. After removing protective covers, they carefully installed the 440-lb. (200 kilogram) piece of equipment onto the end of Canadarm2 as Japanese astronaut Norishige Kanai operated the robotic arm from inside the station. The whole operation was almost identical to the spacewalk Vande Hei and NASA astronaut Randy Bresnik completed in October to replace the other aging LEE at the opposite end of Canadarm2. A little over 5 hours into the spacewalk, after the two spacewalkers successfully replaced the degraded LEE with a spare unit and completed the installation process, ground controllers experienced a software glitch as they powered up Canadarm2 for the first time. 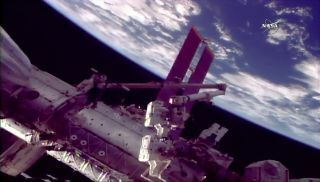 "The Canadarm2 software is not communicating properly with the newly installed spare LEE," NASA TV commentator Rob Navias said during the webcast. "They believe the problem may be associated with this mate/de-mate mechanism that connects all of the electrical and communications connections for the arm, so they're going to do a cycle of that and see if that corrects the problem." The ground control team at NASA's Johnson Space Center in Houston fixed the glitch by rebooting the robotic arm, and the two astronauts were able to finish their spacewalk by 2:13 p.m. EST (1913 GMT), almost an hour behind schedule. This was the first spacewalk of Tingle's career and the third for Vande Hei, whose cumulative spacewalking time now amounts to 20 hours and 45 minutes. Though both astronauts were able to complete their assigned tasks without too much trouble, rookie astronaut Tingle did struggle to gain his footing for several minutes as he climbed onto a portable foot restraint early on in today's spacewalk. "Sorry that took so long," Tingle told his spacewalking partner and the ground-control teams after he conquered the tricky piece of equipment, which resembles a pogo stick. "Dude, that didn't take long at all," Vande Hei reassured him. While NASA TV was originally scheduled to provide live coverage of the spacewalk starting at 5:30 a.m. EST (1030 GMT) with the crew's preparations, the webcast started about 2 hours behind schedule as NASA centers reopened following the three-day government shutdown. Other than the delay in the live broadcast — and despite the fact that thousands of NASA employees were just returning from furlough, the government shutdown did not affect this spacewalk. Today's excursion marked the 206th spacewalk conducted by ISS astronauts in support of the station's assembly and maintenance, the first spacewalk this year and the first of two spacewalks NASA has planned for this month. On Jan. 29, Vande Hei will take another spacewalk, this time with Kanai, and the duo will work to store the degraded LEE (that was uninstalled during today's spacewalk) back on the external storage platform, where it will remain as a spare just in case.